18.02.2015 The "troika" of the European Commission, European Central Bank and the IMF are putting pressure on the government of Greece, threatening to switch off their funding so that the Greek government submits to the "troika’s" programs of debt repayment and structural adjustment. These programs, with the complicity of the Greek bourgeoisie, have plunged the country into misery. In the face of this blackmail, it is necessary to organize the broadest international solidarity with the workers and people of Greece. What is needed is a campaign for the cancellation of debt and of opposition to these austerity plans. 25.01.2015 On January 25th there will early elections in Greece, elections which are being followed with huge expectations throughout all of Europe. These elections have emerged as a product of the profound political, economic and social crises that have shaken Greece to its foundations for more than 6 years, placing it at the center of the hurricane of the capitalist crisis. A Breath of Fresh Air for Hollande and the Fifth Republic. But for how long ? 16.01.2015 The attack against Charlie Hebdo and the anti-Semitic hostage taking in a kosher supermarket at Porte de Vincennes to which the immense republican marches of this past weekend responded have set the stage for Hollande’s comeback on the front of the political scene. In only a few days, the conjuncture has been profoundly modified. It remains however to be known if this situation will consolidate itself. 02.12.2014 Last Tuesday, November 18, two Palestinians armed with a knife and a pistol entered a Jerusalem synagogue during morning prayers and killed 4 Israeli Jews, while 5 others were wounded. The Israeli police quickly took over the place and killed the two attackers. 15.10.2014 At times when the youth of Hong Kong have rebelled, when the echo of this movement can resound in other hot areas of the periphery of China like Xianjiang, and in the context of the constant increase of the workers' struggles, an internal debate within the Chinese Communist Party (CCP) is exploding publicly days before a key meeting. 18.09.2014 If there is an area where the French President seems effective, it is in the unprecedented level, in recent history, of France's military intervention. Winners and Losers in Operation "Protective Edge"
18.08.2014 While President Obama is enjoying his vacation, US airplanes and drones are again dropping tons of bombs on Iraq. This new military venture of the United States in the Middle East began on Friday, August 8 and has as an objective: stopping the advance of the so-called Islamic State of Iraq and the Levant, or just Islamic State, that, since June, has occupied about one third of the territory of Syria and a fourth of that of Iraq. According to Obama, what motivates these bombings is protecting Christian groups and those of the Yazidi minority (a group of the population that professes a different religion), savagely persecuted by the ISIL, this new "Frankenstein", that emerged from a detachment of the Al Qaeda network during the US occupation of Iraq. 07.08.2014 "Mission accomplished," said Israeli Prime Minister Benjamin Netanyahu, after announcing the withdrawal of Israeli troops from the Gaza Strip. It was almost 30 days of a military offensive that left a toll of 1900 dead, more than half, civilians, among whom are numbered more than 400 children, and 9,500 wounded (of whom, 2,500 are children), more than 10,000 dwellings destroyed, as well as basic infrastructure, like the only electrical power station, schools, hospitals (30% of which had to close because of the damages they experienced) and mosques. Have Arabs and Jews always been enemies? 04.08.2014 The title refers to a common belief used to justify the eternal conflict between Israelis and Palestinians and the current offensive in Gaza. But that supposed ontology of hatred is false. Arabs and Jews lived together for centuries under Moorish control of Andaluz in the Spanish empire. 01.08.2014 The Gaza Strip has been devastated. After 23 days of massive bombings and of the bloodthirsty attack by land, there are more than 1,300 Palestinians dead, 75% of whom are civilians, among them, some 250 children. 31.07.2014 The UN is neither more nor less than the link that gives an international cover to the wicked mechanism of mass murder that was started in Gaza. Ukraine: The civil war and the geopolitical disputes are continuing. 29.07.2014 The shooting down of the Malaysia Airlines Flight 17 airplane, that caused the death of its 298 passengers, while it was flying over the eastern area of the Ukraine, has touched world public opinion and caused a jump in the political crisis that this East European country has been going through for more than seven months, and that has big geopolitical implications as one of the fronts of the disputes between the imperialist powers (the US and the EU) and Russia. 25.07.2014 The number of those dead and wounded because of the bombings and the military land offensive of the State of Israel continues to increase significantly. There are no words to describe the atrocities that the Zionist Army is committing; they have bombed hospitals, schools, mosques and even a group of children that were playing on a beach. They have already murdered more than 700 Palestinians; they have wounded another 4,000, and there are tens of thousands of refugees. 70% of the dead are civilians and more than 20%, children. After 16 days of massive bombing and 6 days of an invasion by land, Israel has caused a huge humanitarian crisis, and its Prime Minister, the Zionist Benjamin Netanyahu, has declared, with complete impunity, that the operation "will continue until it achieves all the objectives". FT-CI Statement - End the Israeli attacks on Palestine! For an immediate end to Operation Protective Edge! 17.07.2014 After a seven-day bombardment of the civilian population of Gaza resulting in a death toll of 172 (36 of them children) and over 1,500 injured, the right-wing government of Israel is continuing Operation Protective Edge while assessing the ceasefire proposed by the military-backed Egyptian government. 13.07.2014 From the early morning of Monday, July 7, the State of Israel launched a military offensive called "Protective Edge" on the Gaza Strip, consisting of the massive bombing of this densely populated Palestinian territory and threatening a ground attack. "In Argentina, the anti-capitalist and socialist left is beginning to take shape as a real alternative"
15.02.2014 Some aspects of the situation in Argentina and the lessons that the international far left could draw from the FIT. 06.02.2014 Paul Murphy is Member of the European Parliament for the Socialst Party in Ireland, the Irish section of the Committee for a Workers International. 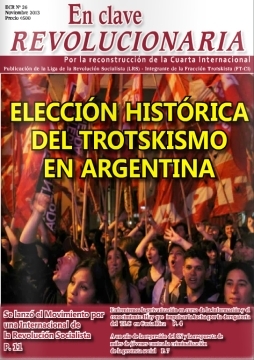 26.01.2014 In October, 2013, the Left and Workers' Front (FIT) got 1,200,000 votes in the legislative elections in Argentina. Last Saturday, January 11, Christian Castillo, a national leader of the Partido de los Trabajadores Socialistas (PTS) and a Deputy of the FIT in the Province of Buenos Aires, went to a hall filled with an audience of more than a hundred people, composed of university students, high school students, workers and militants of the Left, where he told about this experience. 23.01.2014 During the month of January, Christian Castillo will be visiting several countries of Europe to get to know at first-hand the situation of the workers' movement and of the Left in one of the epicenters of the capitalist crisis. 04.01.2014 Christian Castillo, recently elected deputy for Buenos Aires Province, will be speaking on the recent election campaign, waged by the Workers’ and Left Front (FIT) on its policies and on the class struggle in Argentina. 09.11.2013 The recent mid-term elections in Argentina, which took place on October 27, represented an important defeat for President Cristina Kirchner and her Front for Victory. At the same time, the Trotskyist left performed very well. Author Daniela Cobet , Marcelo N.
No to imperialist intervention in Syria! 30.08.2013 The United States and its allies are at the point of launching a new military attack in the Middle East. 18.07.2013 In January 2010, US Secretary of State Hillary Clinton made freedom of expression on the internet a cornerstone of US diplomacy. 07.07.2013 Powerful mass demonstrations sealed the destiny of the Egyptian President Mohamed Morsi who was toppled on July 3 by the army in a ‘soft coup’ supported by the wide spectrum of opposition to the Muslim Brotherhood government. 08.06.2013 The situation that has begun in Turkey shows, once more, that, when there is dry grass, a spark is enough to ignite a political bonfire. 27.05.2013 Raúl Godoy, one of the leaders of the Zanon ceramic factory under workers’ control in Argentina, is currently visiting several European countries. Godoy, who is also an elected member of the provincial parliament in Neuquén for the Workers’ Left Front and a former general secretary of the provincial Ceramic Workers’ Union, is speaking at a series of workers’ meetings. 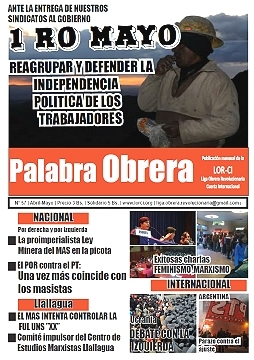 20.05.2013 Raúl Godoy is a Zanon worker, a leading member of the PTS and Provincial Deputy in Neuquén from the Workers’ Left Front (FIT) in Neuquén, Argentina. 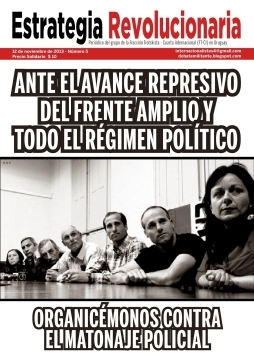 The FIT is composed by three Trotskyist parties, the Lista Marrón (a ceramist workers’ trade union list) and the Ceramist Workers and Employees’ trade union (SOECN) from Neuquén. 18.11.2012 On November 14, the State of Israel set in motion Operation “Pillar of Defense,” murdered Ahmed Al-Jaabari, a senior Hamas military leader, at close range, and launched an aerial attack, which is still underway, on the Gaza Strip. 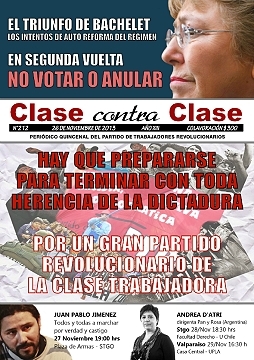 13.11.2012 Statement of Clase contra Clase (Class against class) from the spanish State, CCR4 NPA (New Anticapitalist Party) from France, Revolutionary Internationalist Organization from Germany. 28.09.2012 Five years after the beginning of the capitalist crisis, an international scene marked by big upheavals, political crises and potentially explosive social situations is taking shape. Why does the far left refuse to propose "the Socialist United States of Europe?" 04.11.2011 In the middle of the historic crisis of capitalism at an international level, the different European bourgeoisies have led Europe to a new dead end. 27.09.2011 Since last week, the picture of French President Nicolas Sarkozy and British Prime Minister David Cameron in Benghazi, next to the leaders of the Libyan National Transitional Council (NTC), has been going around the world. 26.08.2011 On July 22, Norway was shaken by the most horrific massacre since the end of the Second World War. First, a bomb destroyed a government building in the center of Oslo, leaving at least 7 dead. 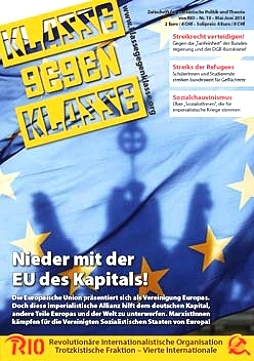 03.07.2011 The political crisis in Greece and the growing workers' and popular resistance and mobilization more sharply express the contradictions that Europe is going through. Workers’ riots catch on in the "workshops of the world"
03.07.2011 Last weekend, in Zengcheng district in Guangzhou, an industrial city of Guangdong province, thousands of migrant workers hit the streets, burning cop cars and confronting the anti-riot police.